This article provides an overview of the current rules in Canada for using drones. Maximum Altitude: With your drone, you are not allowed to climb higher than 90 meters in Canada. Maximum horizontal distance and FPV: Multicopters must always be used within the direct line of sight, but not more than 500 meters. Operation in clouds is therefore not allowed. Compulsory insurance: For private pilots is, in my understanding, no compulsory insurance necessary. Nevertheless, you should have a corresponding policy. Further information can be found in our article about drone insurances. Maximum take-off weight (MTOW): Up to a weight of 35 kilograms, you do not need additional permits in Canada for private purposes. Distance to airports: Your drone must not approach closer than 9 kilometers to an airport or heliport. Other safety distances: Observe a minimum distance of 75 meters to buildings, vehicles, ships, animals, and persons. For a forest fire must also be considered a minimum distance of 9 kilometers. You are not allowed to fly in all other situations in which rescue teams are deployed. Permits to fly: The use of drones in Canadian national parks requires a permit from the park administration. Operating times: Flights at night are not allowed. Special regulations: The name of the driver must be legibly attached to the drone with his address and telephone number. If any of the limitations apply to you, you must still notify Transport Canada and provide a statement that you comply with all safety requirements. Good to know: The rules mentioned here are also valid for flights within buildings as long as there are people in the building who are not directly involved in the execution of the flight. 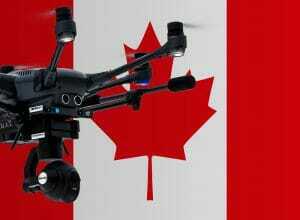 We have researched the listed drone regulations for Canada to the best of our knowledge. We cannot guarantee the correctness of the information. If you want to be on the safe side, contact the competent aviation authority. Alternatively, you can also ask the embassy in your country for further information about the regulations. Please leave us a comment when you receive news and/or gain experience with your copter in Canada!